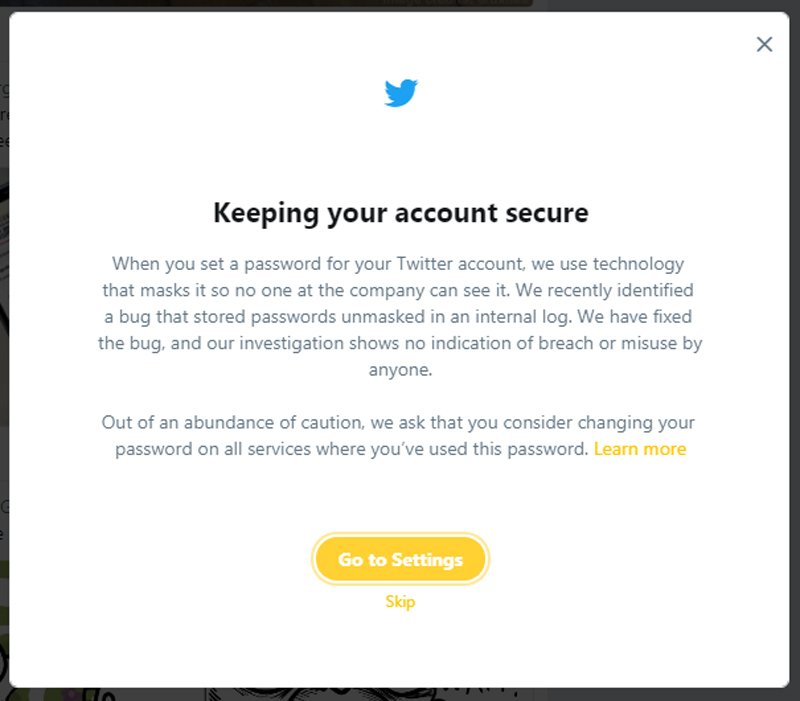 SAN FRANCISCO - Twitter on Thursday (May 3) urged its more than 300 million users to change their passwords, saying they had been unintentionally "unmasked" inside the company by a software bug. "Out of an abundance of caution, we ask that you consider changing your password on all services where you've used this password," Agrawal told users. Twitter shares ebbed about a per cent to US$30.36 in after-market trades that followed word of the password mishap. Going public with a security slip and getting users to take precautions is preferable to remaining mum and hoping no data was taken, according to independent technology industry analyst Rob Enderle. "When in doubt, it is better to have people change passwords than to be wrong," Enderle said. "With security, it is always better to err on the side of caution." The analyst thought it unlikely people would abandon Twitter simply for being asked to change passwords. "Openly admitting our mistakes quickly, learning, and moving on," Twitter co-founder and chief executive Jack Dorsey said in a tweet that including a link to Agrawal's blog post. Twitter last week reported its second consecutive quarterly profit, boosting the outlook for the platform after years in the red. The social network earned US$61 million in the first three months of the year, helped by strong growth in advertising revenue and modest gains in users. First quarter revenues rose 21 per cent from a year ago to US$665 million, and the key metric of monthly active users increased by six million from late last year to 336 million. Dorsey said while discussing earnings that recent changes made to the service have helped "engagement," a measure of how often people turn to the social network and how long they stay.